It's kinda too bad you went back to Glenmont for dinner. There are scores of decent and relatively inexpensive restaurants around DC (some of my favorite are in Adams Morgan, along Barracks Row, and along H St NE). We weren't sure which ones were not only close, but cheap and overall a good experience. That's why we opted to go back into Glenmont for dinner. I plan to go back when it's not ridiculously humid and hot out so I can walk a bit more and sample more things. Looks like DRBA got it on a contract to buy VMSes with the NJTPA, same exact signs and structures..... just painted green. That single lane closure is long term for bridge painting. I had to deal with it last month, but there really wasn't any backup. In general, there was a lot of traffic from Maryland northward today. There was much less heading down in Maryland, but it looked like today that was also not the case, with decent amounts of traffic going both directions all the way to Exit 60 on I-295 in New Jersey. The Delaware Memorial Bridge signage is kinda like that kid that wants to act cool by using phrases that were cool 5 years ago. I believe every time I've crossed into Delaware, one of the signs has stated "Click It or Ticket"...even though there's no Click it or Ticket campaign going on. And you see above what you get when you enter New Jersey. 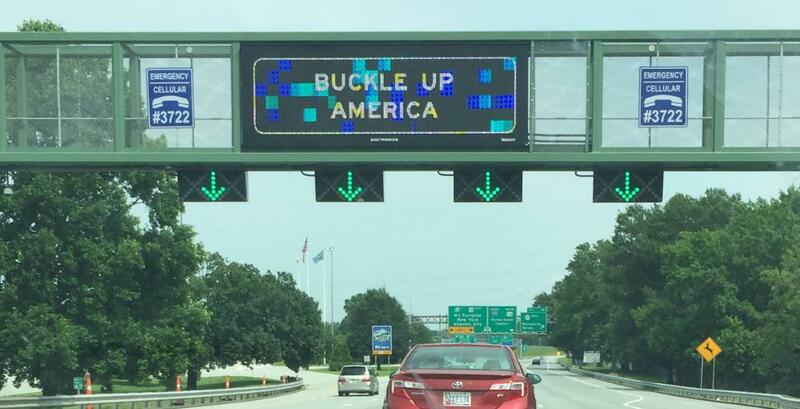 Not "Welcome to New Jersey", but rather "Buckle Up America". The one lane reduction on the NJ-bound span has resulted in heavier than normal amounts of traffic congestion. It could be the visual distraction of seeing the towers completely wrapped in scaffolding. The 1st tower you encounter leaving Delaware was completely wrapped up in white plastic, which was taken down over the past week or so. I don't recommend taking 95 toward Philly because of that traffic congestion. There's almost always some significant delays with that construction zone. 295 in NJ is a much faster route (not to mention higher speed limit). Of course, if you are wanting to clinch certain highways, I understand the reasoning for taking such a road...even though that congestion will still waste some time. Once in Delaware, traffic continued to flow nicely, until the I-295 interchange. I've never seen so many cars who literally are fighting to get over at once. It was kind of harrowing honestly, because we almost got taken out by someone who didn't look trying to get into the lanes for I-495. You would've encountered the traffic from 495 prior to the traffic from 295, so I think you may have mixed something up here. And going South, there's no ramp to go from 95 South to 495 North. I'm guessing you used EZ Pass at the tolls. Do you recall if the EZ Pass Express lanes were 65 mph thru the toll plaza? Highway prices for a soda. That's why looking for a Wawa off of 95 in Maryland is so worthwhile! The standing on a moving subway is definitely something that'll catch you off guard the first few times you do it. Eventually you shift your weight and prepare, although there's always an unexpected jerk or tug that'll catch you offguard. Which hotel did you stay at? It should've been in the hotel details if the breakfast was free. Generally, the higher the hotel is in its hotel chain (ie: Marriott vs. a Fairfield Inn), the more likely the breakfast isn't complimentary. Baltimore is an enjoyable city. From a roadgeek standpoint there's numerous flaws, but the city itself is easily walkable with plenty of restaurants and things to do. How'd you enjoy the 295/76/42 interchange construction? You will probably have a better time in DC - or almost any city for that matter - in the spring and fall. I sweat easily as well, although looking at DC's weather on Saturday, it was mid-80's, mostly cloudy, and the humidity was fairly low - only around 50%. Drinking lots of water and Gatorade helps. Many tourists aren't used to city conditions, which includes walking long distances on sidewalks, and don't drink enough - or they only drink water, and don't get enough electrolytes. The subway in DC is known for a fairly herky-jerky ride that makes standing somewhat more difficult. The train operators seem largely incapable of stopping the trains in a smooth manner or of hitting the marks on the platform—more than half the time, they'll pull into a station, then announce the train will move, then jerk the train forward two or three times in small amounts. Of course I understand why tourists don't know to expect it, but it still puzzles me how many regular commuters stand up as soon as the train approaches a station and then act startled when the train jerks forward and throws them off-balance. Last week the trains were extremely crowded in the afternoons, which didn't help either. Thursday I felt like my arm was getting yanked out of its socket as I tried to hold the overhead rail while my wife held onto my other arm for lack of anything else to grab for support. ...while my wife held onto my other arm for lack of anything else to grab for support. Now that ATC is slowing being rephased in (after being taken out because of the 2009 Red Line crash), there should be improvement on the "jerkiness". What's interesting is that the 7000-series train that's running on the Blue Line stops much more smoothly even though it's under manual control. I don't know why, but one of the train operators did say it's a much easier train to operate (he didn't explain why and I didn't have time to ask). A full four months have passed since I've been to DC, and yet, no new orders on older stock are being built. It's kind of needed, given how DC is really touristy. Road-wise, in the DC suburbs, I-270's traffic was horrid south of exit 22. Usually, it is pretty much free-flowing for its entire length. Capital Beltway is full of people who drive WAY too fast for design standards (seriously, on our way home from the Wiehle-Reston E. station (yep, tried a new way into DC other than Shady Grove), there was 3 miles for us to make it to I-270 (coming from around exit 41), we barely missed exit 38, I-270). Hope you had more luck than my family Zeffy, because driving in the suburbs is pretty gosh darn horrid. there was 3 miles for us to make it to I-270 (coming from around exit 41), we barely missed exit 38, I-270). Hope you had more luck than my family Zeffy, because driving in the suburbs is pretty gosh darn horrid. After entering near Exit 41, you literally have to merge over only 1 lane. You couldn't do that in a 3 mile span? We were somewhere on the right lane (Pennsylvania laws are gonna kill me). Add fast paced drivers to that, then yes, it is a real pain in the neck (seriously, doing that is easier said than done). I think what I tend to find most annoying at the I-270 exit y'all are discussing is something that happens all over the DC area: People who drive down the two lanes that continue on the Beltway and then slow to a crawl at or near the gore area in an attempt to shove over and cut the line onto I-270. While I dislike tailgating and I normally do not do it, this sort of situation is one exception—if I'm in extremely slow traffic in the lane that's exiting and you're in a thru lane and you try to cut over a solid line because you didn't want to wait on line like everyone else, I will pull up close behind the car in front of me to box you out. This is a different situation from when a lane ends. There it's entirely appropriate and correct to use the entire lane that's ending and merge at the end. But in the Beltway Exit 38 situation, the people are in a thru lane—their lane doesn't end, they just think their time is more important than everyone else's. Either way, if noelboetevera was coming from the Reston Metro stop, he would have had to have entered the Beltway in Virginia, most likely at either the Dulles interchange (I think it's Exit 45 now? I still think of it as Exit 12!) or Georgetown Pike (Exit 44). True, it's possible he could have gone over Chain Bridge and looped back out, but I find that unlikely, both because it's well out of the way but especially because you cannot legally turn left onto outbound Canal Road/Clara Barton Parkway from Chain Bridge. So if he entered the Beltway in Virginia, the driver would have had a good seven miles to move over towards the left; also, most drivers will have moved at least one lane to the left on the American Legion Bridge due to all the merging traffic coming from the GW Parkway. But, in fairness, depending on who the driver is, where he's from, and his driving style, the Beltway can be intimidating if you haven't driven on it before or if you haven't done so very often. You certainly have to be prepared for aggressive driving that may be unnerving if you're not used to it. See, during the summer in DC, it's not unusual to have days when the temperature is in the mid-90s, the humidity is high such that it feels like it's over 100°F, and the air quality is bad so the sky looks hazy and grey instead of blue (the TV and radio weathermen will refer to a "Code Orange" or "Code Red" air day to warn people to limit outdoor activity; there's also an even worse "Code Purple," but I think I've maybe heard that invoked one time at most, if ever). This summer just hasn't been all that bad so far, other than all the frigging rain! It rained again about an hour ago as I type this. The rain certainly doesn't help with humidity. But at least the TRULY super-hot days are rare too (two years ago we had a day when it felt like 121°F). Saturday wasn't anything like what I just described, which is why I said it was a fairly pleasant day. By that I meant it was a pleasant day considering the time of year and where we are (July in DC). I'll never forget the time it was so hot the day before July 4 that when I was walking from the Metro to my office, I could feel the heels of my shoes—we still wore suits to work back then, so these were hard-soled business shoes—sinking into the pavement as I crossed K Street. Yep! It was a nice convenience. The AET-gantries are a really nice addition to tolling plazas. So I noticed! The Yellow Line was packed though, so I had no choice. I found out the best way to alleviate it is to lean back against the car (I leaned against the map while grasping the pole). We stayed at the Hilton Garden Inn. The breakfast was $12 there. It was nice. There wasn't any backups, and everything is clearly marked, so there's no confusion really. Very true. I should've drank more water instead of the copious amounts of soda I drank over the weekend entirely.